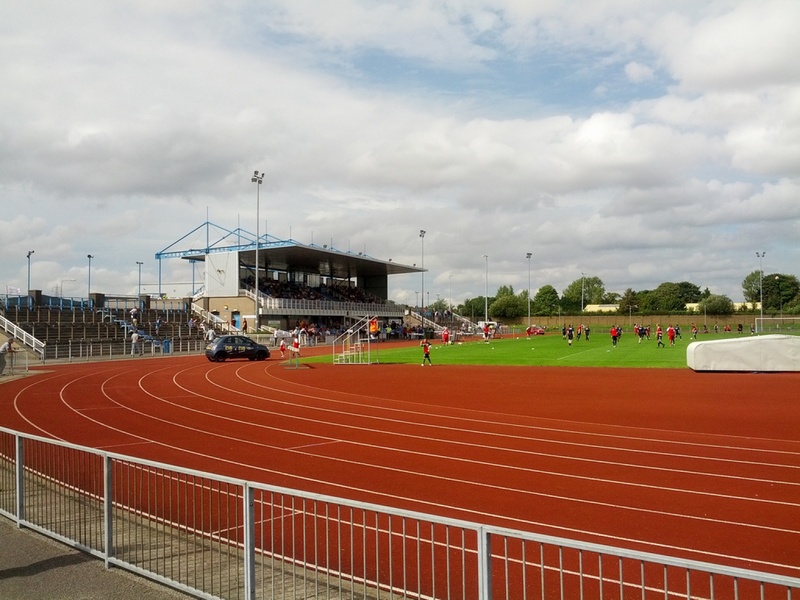 The South Kesteven Stadium was built by South Kesteven District Council in 1991 as a multi-purpose facility and it houses both Grantham Town FC and the Grantham Athletics club. The clubs previous home was on London road in the town centre. The ground was shared with Grantham Cricket club who owned the lease on the facility with the Football club having use only for the winter months an arrangement that usually meant away games had to be arranged at the start and end of the playing seasons when the two sports overlapped. When the Cricket clubs lease ran out the owners decided they wanted to sell the site but planning permission for development as a supermarket was dependent on both clubs being rehoused and the developer of the site provided funds for this. The Cricket Club were rehoused to their current out of town ground on Gorse Lane but the Football Club needed a ground within the town itself. Despite strenuous efforts by both the club and the developer to find suitable land within the town for the new ground none could be found and eventually SKDC came forward with additional money to build the current multi-purpose stadium on what was the Meres playing field. This field contained a number of football pitches and many locals will have played there in the halcyon days of local football and despite the new stadium being named the South Kesteven Stadium it is known by many locals simply as “The Meres”. Once SKDC had agreed to build the new stadium the developer of London Road was anxious to begin work on the supermarket on the site as soon as possible and the club agreed to move out part way through the 1990-91 season and ground shared for the remainder of that season with Spalding United at their Sir Halley Stewart ground. The club returned home on completion of the new stadium only picking up the keys on the morning of the first game in August 1991 when in front of a crowd of over 1400 they lost an FA Cup tie to Ilkeston 5-1. The stadium was initially built to Conference standards and several improvements have been carried out over the years. The initial build provided the club with just the shell of the social club area on the first floor of the main stand building. This area is run exclusively by the football club and they fitted it out to provide a social club / bar facility. Recently the club have totally revamped this social club area to create the MCS centre to provide separate bar and functions rooms together with a separate sponsors lounge. Other improvements have seen the addition of a disabled lift up to the first floor MCS centre, the conversion of a former police room on the ground floor into a hospitality / meeting room and the provision of a pitch irrigation system. The surrounding Meres site has undergone considerable change since the stadium was built. The town’s leisure centre was built adjacent to the stadium which also houses a dedicated table tennis centre. An artificial pitch soon to be upgraded to a 3G surface has been built behind the stadiums east stand and adjacent to this is the one remaining grass pitch from the old Meres playing field. The make-up of the site is completed by the indoor bowling centre. The running track around the pitch has over the years attracted criticism from the football purists but the unobstructed views from the cantilever design main and east stands are as good as any and the club are proud to occupy the stadium.